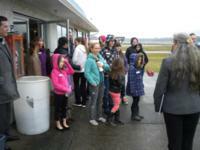 A group of young women, mostly pre high schoolers from our Nanaimo School district and intrepid parents braved the weather to see what the world of aviation has to offer women. The event was organised and led by NFC’s VP Andrea Trepanier with able if damp assistance from Jenny Janecek and Nanaimo Airport’s Sheri Barker. They were introduced to the facilities at the NFC clubhouse before walking across the wet grass to enjoy a spirited talk by Willie & Company at Nanaimo’s NavCan Flight Service Station. They were treated to at least one arrival in the poor weather as well as visuals from the computers at Tofino and Victoria. The girls enjoyed the view from the tower windows then left to brave the rain across the ramp to the airport terminal building where they saw the CATSA operation the baggage checks and went into the departure lounge to see the departures and arrivals before the highlight of the visit to the operations hangar. 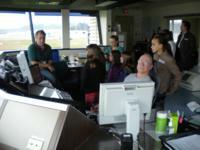 There they were given a short talk about the operations and maintenance of the airport by Reg Brady. He demonstrated the loading of the truck’s water tanks much to the amusement of the girls when the tank overflowed (deliberately Reg says). 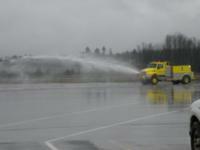 Then the real fun – rides in the airport fire truck up front and saw the long thrust of the powerful water gun. Then another wet walk back to the NFC clubhouse and a quick look at a C-172. Weather was too poor to fly so the girls had to forego that pleasure Andrea had planned for them. A short talk and some gifts conclude the unfortunately wet Friday morning. Kayla won the draw for a flight accompanied by dad Tyler and friend Jayda with Andrea the weekend after, thanks Autumn, for the plane. Women in Aviation International has seven chapters across Canada – Nanaimo unfortunately is not among them. With the successful conclusion of its 24th Annual Conference last month at Gaylord Opryland in Nashville, Tenn., Women in Aviation, International (WAI) president Dr. Peggy Chabrian has now turned her attention to major networking and outreach as part of WAI’s 25 years of conferences. The Nashville 2013 Conference set a new record with 3,375 attendees representing all segments of the aviation community. From March 4 to 10, 2013, over 2,100 volunteers across four continents — Africa, Asia, North America and Europe — introduced more than 17,000 girls and women to the opportunities vailable in the air and space industry as part of the Women Of Aviation Worldwide Week celebration, held annually during the week of March 8, anniversary date of the first female pilot license worldwide. Studies have demonstrated that a key barrier to women’s participation in the technical fields of the air and space industry (~12% overall; 5% for pilots) is the lack of awareness of the opportunities available to them. Women in Aviation Worldwide Week aims to foster diversity in aviation by celebrating history, raising awareness, and sparking vocations among the female population. Nothing can spark aviation vocations like experiencing the magic and sensations of flight in a small aircraft. Many of 74 events included an invitation for girls and women to try flight in a small aircraft. 333 pilots flew 109 types of aircraft for more than 1,500 hrs (enough hrs to fly a small aircraft around the globe 12 times) introducing 5,316 girls & women to flying. For reference, the largest female airline pilot rated population resides in the USA and totaled 5,818 in 2012. That year more than 400 flights allowed NWT’s Yellowknife to win the title. The top three contenders in 2013 orchestrated more than 500 flights each. Lead by event organizer, Jill Oakes, the St. Andrews Airport in the greater Winnipeg area, Manitoba wins the “2013 Most Female Pilot Friendly Airport Worldwide” title with a whopping 680 documented flight introductions in approved aircraft. Eighty local businesses and associations supported the event that offered far more than just flights to the close to 3,000 attendees. Prominent Women Of Aviation were on hand to inspire and answer questions, instructors operating four simulators gave hands-on experience to the girls and women, local flight schools and associations informed attendees about the next steps, and potential employers presented all the options available. 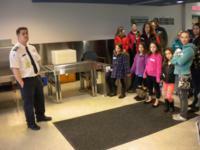 “The end result is about 40 girls signed up for ground school,” said Ms. Oakes. Yellowknife, NWT is the first runner up with 634 flights and Kitchener-Waterloo, Ontario, is the second runner up with 517 flights. www.wai.org for more on Women in Aviation.